Even if you don’t enjoy reality TV, chances are you’ve heard of the Gosselin family and maybe even seen an episode or two of the popular TLC show Kate Plus 8. During the height of reality television, the Gosselin family skyrocketed to fame as Discovery Health released Jon & Kate Plus 8 in 2007. The show itself tells the captivating story of couple Kate and Jon Gosselin who were parents to a set of twins and a set of sextuplets. Eventually being broadcast on TLC and renamed to Kate Plus 8 following the couple’s divorce, the show continued on showing the daily lives of Kate and her eight young kids. As vacation lovers, the couple has traveled many places with the family but in Season 4, the whole family visited Corolla! Now you can rent the same gorgeous beach home that the Gosselin family stayed in during their trip! 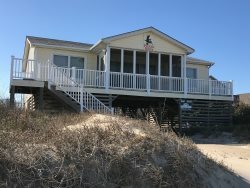 Victorian Fan Ta Sea is an awesome 5-bedroom oceanside rental in Corolla, NC with plenty of space for a large family (and don’t forget your 4-legged best friend because this home is Pet-Friendly too)! Perfect for your next coastal getaway, Victorian Fan Ta Sea is a large Victorian-style home packed with amenities and sits less than 500 yards from the beach. New to Seaside Vacations Rental Program in 2019, available weeks in Victorian Fan Ta Sea will rent very quickly. The home features 3 King bedrooms (one is a full Master Suite), a Queen bedroom and a Bunk Bedroom along with 3 full bathrooms and 2 half baths. Kids of all ages will love the downstairs recreation room as they shoot a few rounds of pool or sit down to play their favorite board game for family game night. Both the living area and modern kitchen with updated appliances were designed for a larger group of guests so there is plenty of seating and tons of space for the whole family to enjoy a good meal or a relaxing movie together – precisely why the Gosselin’s chose this house! The outdoor living space is even more relaxing. With a selection of covered porches and wrap around sun decks, guests can sit outside and soak up the ocean breeze rain or shine no matter the time of day. But the most exciting (and relaxing) feature of Victorian Fan Ta Sea? A huge 16’x32’ private saltwater pool right in the back yard. Whether you want to swim a few laps in the morning, lounge around the pool all day with your favorite book and a drink in hand, or splash about in the afternoon sun with the kids, your whole family will love spending their vacation around this awesome pool. When you aren’t enjoying the home’s many amenities, you’ll love exploring Corolla. From small family-owned shops, restaurants that serve fresh locally caught seafood and nearby historic attractions, there’s always something to do in town! One activity we highly recommend is taking a safari-style tour of the 4x4 beaches where the Corolla Wild Mustangs roam. The wild horse tour excursion Kate and her kids took is featured in the episode and if you watched it, you’ll get a great idea of what to expect. There’s nothing quite like seeing horses running free among the ocean waves so we’re sure you’ll have just as much fun as they did! Watch It Yourself: If you're interested in watching the Gosselin's explore the Outer Banks and vacation in Victorian Fan Ta Sea, the episode can be purchased from Amazon!